Hey guys! Don't you just love it when the sky is clear? I admit to having a love and hate relationship with the sun. I love a sunny day but I also hate the sun's harmful rays which is why I never leave home without my umbrella and sunblock. Thank heavens there are so many products in the market that offer protection from UV rays like BB Creams. I've tried different brands like Shu Uemura, Clinique, Dr. Jart, Neutrogena, Missha, Tony Moly, L'oreal, Garnier, Too Cool for School, Maybelline and Celeteque (wheh!) but the BB cream I've always wanted to try is Skin79 Hot Pink. I've read a lot of great reviews on Skin79 but because this brand is not widely available in Manila and there are so many fake versions being sold out there, I never got around to buying one. Several months ago, I came across Suesh Cosmetics' website and saw that they're selling Skin79 BB creams in full and trial sizes. I've been to their Trinoma outlet countless times but trial sizes were always out of stock. Last week when I met a friend for coffee, I tried my luck for the nth time and dropped by their stall. When the sales rep said they have trial sizes of the Skin79 BB Plus (orange), I asked right away what makes it different from the Hot Pink variety. She said the only difference is the higher SPF. I really didn't need much convincing since I've been waiting too long to try it and besides, the tiny tube was only 150 Php so I finally bought one. The Skin79 Beblesh Balm trial size comes in a small orange tube with a twist off cap. The back of the tube shows that it has SPF 50+ PA+++ for protection against UV rays. I actually like the squeeze type tube with a narrow nozzle to carefully dispense the product and prevent wastage. I also like carrying this around in my bag for quick touch ups. The Skin79 Plus BB has a creamy texture and a very subtle scent that's almost undetectable. It spreads easily and the formula seems to melt immediately upon application. It gives you an instant pearly white finish which I guess is expected of products with high spf. Although it initially gives off a white cast, it blends eventually with your complexion giving you a healthy glow. It may appear a bit shiny but you may balance it off with a finishing powder. Remember, when using BB creams don't slather a generous amount in a single application. Instead, squeeze out a pea size, dab it around your face using your finger tips then spread either in a swiping or patting motion. You can layer it if you think you need more coverage but be careful not to overdo it. Chances are you will achieve your desired look without the ghostly cast if you do it this way. You'll notice being oily after about 2 hours of use but a little finishing powder is all you need to control it. Staying power is quite disappointing with obvious fading after 4 hours. Now let's see how the Skin79 Plus BB fairs compared to my all time favorite BB creams, Tonly Moly Luminous Goddess Aura and Clinique Age Defying. In terms of color and consistency, Skin79 is more similar to Tony Moly Goddess Aura, both having a subtle yellow undertone and creamy texture unlike Clinique which gives a rosy white hue and has a runny consistency. All three spread effortlessly with Clinique drying off the fastest followed by Skin79 and Tony Moly. As for the white cast, well I've come to realize that it actually depends on the user's complexion and the amount of product used. All three don't give out a ghostly cast when used sparingly but I have to mention that Skin79 seems to appear the fairest. It also appears as dewy as Tony Moly unlike Clinique which has a matte finish. All three offer light to medium coverage while oil control is best when using Clinique followed by Skin79 and Tony Moly. In terms of price, Tony Moly is the most affordable at 748 Php/45 ml tube followed by Skin79 which retails for 1,000+ Php/40 gm bottle and Clinique which is around 1,850 Php/40 ml tube. 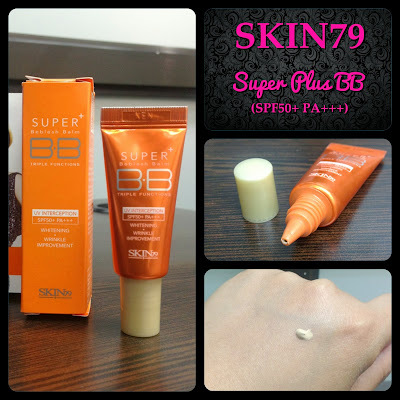 Overall, I really like the Skin79 Plus Beblesh Balm and I will definitely buy a full size bottle when the tube runs out. I do recommend it to those who want to try a really good BB cream. If you're on a tight budget, I suggest you go with the trial size and decide whether to get the full size later. You may buy the trial size at any Suesh outlet store or if you're from Q.C. and have time to spare on October 4 and 5, go to Il Terrazo, Tomas Morato, Q.C. and restock your beauty essentials at the Beauty Fair 2013 from 12NN to 9PM. Thank you so much for reading and have a beautiful day!